The Art of Baguazhang, or 8 Trigram Palm, is one of the most fascinating fighting arts in the world of Chinese Gong fu. It can be defined as the art of continuous change or transformation, and takes his name from the 8 directions, but goes beyond them and describes the art of change and transformation. The great masters of this art have long theorized and discussed about the links between this style and the complex world of the Yi Jing, a system of divination, because both are arts of transformation. Sun Lutang defines Baguazhang as the ultimate art of change and transformation, and shares some similarities with other ‘internal’ systems such as Taijiquan, Xingyiquan and the Liuhebafaquan, which are all Neijia systems of Gongfu. What makes Baguazhang unique, among these systems, is its circular walking, where the practitioner trains to step easily and quickly – but rooted and powerfully – around a circle, inside of the circle, then around two, three, five, up to nine circles or poles, “flying” between the Eight Trigrams (hence the name of the style, representing the eight cardinal directions). The energy used in Baguazhang is almost purely horizontal (Heng Jin), but as soon as the body movements starts to change posture, it also encompasses the vertical power (Pi Jin), which is more visible in Xingyiquan. During this circular walking training, the practitioner also works hard to acquire the timing and the power (via the kinetic chains of the body) which are needed to launch a powerful attack at any time, whilst maintaining flexibility and fluidness to move quickly from any posture. From this situation of stable and continuous floating, the Baguazhang practitioner works to effectively manage the relationship between himself and his personal balance, whilst anticipating to deal with any opponent(s), by moving his arms and legs with precision and effectiveness, transforming straight lines, direct punches or kicks and absorbing them by bending, rotating and twisting the body, using narrow or wide torsions, where intention and physical power are dissipated or become solid and manifest themselves in the next attack. Distance is not a problem for Baguazhang: from long range to body-to-body distance, it is the size of the spiral that leads the way to get inside the opponent. Closing a fight can only happen at short distance. In fact, the secret lies in the powerful spiral movements of the Dragon, which takes the opponent in, the watchful and intuitive eye of the Monkey, in the strength and stability of the Tiger and the speed of rotation of the Eagle. These in fact are the Four Animals “inspiring” Baguazhang practice. The Four Pillars, common to all different styles of Baguazhang, are the Great Mother Circle, the Eight Mother Palms, the Single Change and the Double palm Change. These exercises serve to make the body stable in unstable movement conditions, to be always fluid, using the body connections as a great tool to fighting, and to develop the kinetic chains that lead to the expression of Fajing – blows that destroy. Baguazhang is also famous for its use of open palms rather than closed fists, which are threaded and will “penetrate” the guard of the opponent with sudden strikes to the eyes or testicles, thereby eradicating the structure of the adversary, overwhelming him and taking him to the ground. However this does not negate the possibility of delivering a series of percussion techniques, with all parts of the body, fists, low kicks and some quick takes. Moving around in a circle, with constant twists and spirals, from all parts of the body, is a highly refined exercise, which contains a great deal of challenge, training a sinuous, adaptable way of moving, like the snake or the mythical Chinese dragon, winding and unwinding their coils. Baguazhang works with a particular synergic motion of the body which continuously rotates, turns and twists together, having inside the power of iron in the bones, resulting in creating a sophisticated tool useful for fighting at any distance. Every Baguazhang school develops its own particular tools for training the many different skills which can be applied in the art. In order to remember the applications that Dong taught, the 64 linear palms were created. Zhan Zhuang and Dong Zhuang exercises were devised to increase the body’s power and Lianghuanzhang forms were taught to train the continuously moving body. To remember the quality that the practice has to drive, Youshenzhang forms were created – the equivalent of a martial dance. Partnerwork is the next step, where partners can work together to increase their knowledge of how best to deal with opponents. More than the half of our training time is devoted to working with what would be an equivalent to Taijiquan’s Tui Shou, Da Lu and San Shou systems. From the rough practice of single techniques (Dan Lian) to the more rounded and sinuous Rou Shou, Baguazhang insists attaining a supple, flexible and floating body (yin), which is connected to powerful, suddenly explosive and fast movements. All parts of the body are used for hitting and avoiding. Baguazhang’s fame dates back to its original founder, Baguazhang Dong Haiquan, who during the 19th century brought his art to the imperial court in Beijing, demonstrating the superiority of his technical knowledge. The origins of the style is lost in the ethereal mists of the holy mountains of China, where Dong Haiquan had contact with Taoist “meditation in circle motion” practices, or – according to other sources – where two brothers taught him a system which incorporates an alternating of Yin and Yang or – according to a third hypothesis – Dong himself was indeed the original creator of the art of Baguazhang. According to tradition, his student Yin Fu come from the lineage of Forbidden City bodyguards, which supported the use of Zhuan Zhang (“piercing palm”), while from his pupil Zheng Dinghua spread the Yousheng “swimming drunken body” system, which the famous Sun Lutang later popularized in his books on internal martial arts, the first “Quan Pu” (boxing manual) after almost two centuries of censorship. Almost all of Dong’s best students – with few notable exceptions – were Xingyiquan fighters and experts (many of them were caravan guards and weapon masters, which was a very hard job in those times), and this illustrated the degree of skill required to learn Baguazhang. For this reason Baguazhang was taught only to people who already had a solid grounding in another martial art system, it is certainly not an easy or advisable method for those who want to start from scratch martial practice. Traces of Baguazhang, which became integral part of Xingyiquan, can be found the Pan Gen practice, where only three or four steps are allowed to complete a circle, making movements and body tight, twisted and explosive. Baguazhang weapons are essentially short and pointed, enabling them to be handled in pairs, without creating problems during the typical twisting movements. Examples are the crossed half-moons (also call deer horn knifes), the elbow-long knives, the hand pins (exceeding fist sides, in order to make serious damages), the sabre and in general every double weapon, long and short, from the simplest to most complex. Of course, being today Baguazhang a “classical internal art” together with Taiji and Xingyi, we can find double-edged sword (Jien), sabre (Dao), pole (Gun) and spear (Qiang), together with the long monk hellbard and short stick (Xiao Gun, similar to Aikido’s Jo) and some other specific instruments. 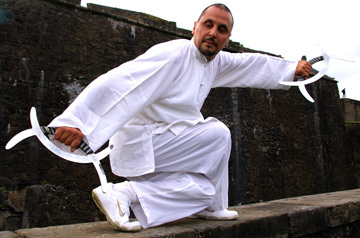 Characteristic weapons (used as tools for specific skills) of Baguazhang are ultimately the Great Dao, the Great Jien and the Great Spear, weapons designed to demonstrate the extreme skill in using the body’s weight, to keep it constantly in motion and not having to use physical force as of the close necessary. Here you will find an Interview on Baguazhang with Andrea Falk.